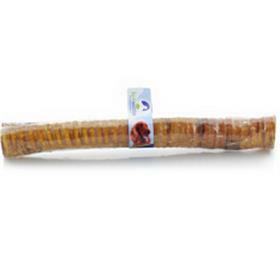 hies 12" Beef Trachea is a great size for medium to large dogs. Barkworthies 12" Beef Trachea are longer lasting for your slightly aggressive chewer and are 100% digestible dog chews, making them a healthy alternative to a traditional rawhide chew. Barkworthies 12" Beef Trachea is FDA approved and produced from free-range, grass-fed Brazilian cattle. Brazil is known for their high quality beef products due to the low disease and contamination count.